On the Main Menu, click Message Search. 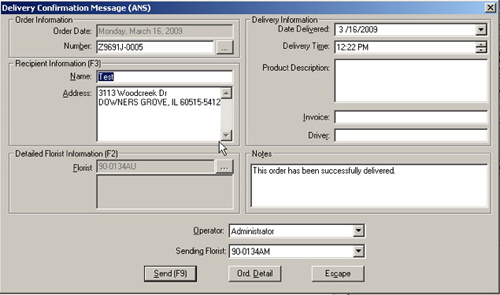 Locate the FTD In message you need to send delivery confirmation for and click it. Click Delivery Confirmation. The Delivery Confirmation - ANS window opens. Verify you have selected the proper message. Fill out the delivery information, including any useful notes for the sending florist. From the Operator field, select your name. Once the Delivery Confirmation message is received by the Mercury Network, you will receive a printout confirming you sent the confirmation and that it was received by the network. You can confirm a delivery in the "Alerts" section of the Mercury Cloud dashboard. In Alerts, click Today's Unconfirmed Deliveries. Navigate to the message whose delivery you want to confirm. Click the arrow to open the message details window. At the bottom of the message details, click Confirm Delivery. After you click Confirm Delivery, the message's status is updated to "Delivered." Note: When confirming a single delivery, you can provide detailed information for the delivery, including the actual date and time of delivery, and the driver of the delivery. You can provide these details by clicking Send Related Message in the message details and choosing Delivery Confirmation from the dropdown. Click Select All or manually select the deliveries you want to confirm. Click Confirm Delivery. After you click Confirm Delivery, the message's status is updated to "Delivered." Note: The delivery confirmation date and time for all deliveries you confirm will be the date and time that you click Confirm Delivery. If you are the filling florist and you receive an incoming order that you cannot deliver on the requested date, you need to decide whether you are going to reject it or send an "Ask" message to the sending florist to see if you can deliver the order on a different date. Keep in mind that if the filling florist sends an "Ask" message and you have not yet received an answer in a timely manner, the FTD Delayed Response Policy rules still apply. If the sending florist does not agree to the delivery date change, they must send an "Answer" or cancel the order. If you are the sending florist and you want to change the delivery date (for example, if the customer has requested a new date), you need to send the filling florist an "Ask" message requesting the date change. If the filling florist can change the date, they will send you an "Answer" message agreeing to the change. If they cannot, the sending florist should cancel the order. In addition to including the delivery date change request in the body of the Mercury message, the delivery date MUST also be changed in the delivery date form field.